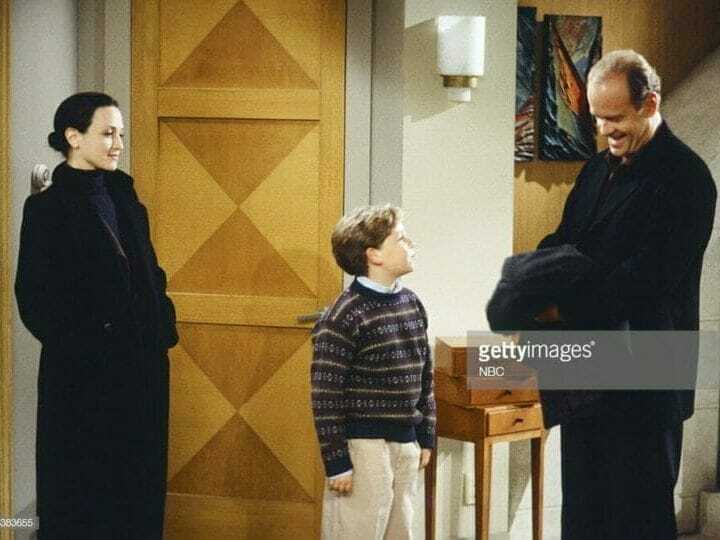 It’s time for Thanksgiving and Frasier Crane will get to have his son, Frederick, over for the holidays this year, as his ex-wife, Lilith, has plans to visit a colleague in Vancouver. However, after calling her colleague to inform him she’s running late she learns that he has become ill and has to cancel. This puts Frasier in the unfortunate position of asking Lilith to stay for dinner. First Frasier’s father comes home and says something rather unflattering about her before learning that she’s there. 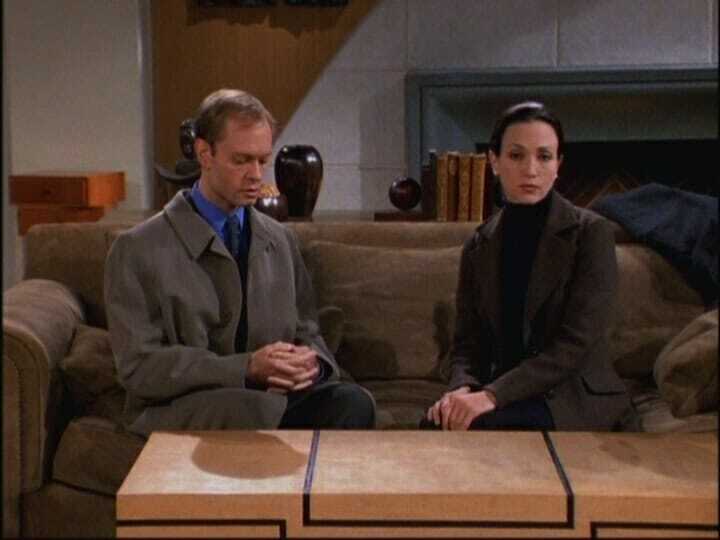 Sometime later Frasier’s brother Niles comes in, which did bring about some concern as they had a “tryst” while Frasier and Lilith were trying to reconcile their marriage. Surprisingly Niles and Lilith are being extremely civil and Frasier will have none of that. Instead he demands that they go back to insulting each other as they did before. Prior to dinner Frasier and Lilith are talking and he learns that Lilith is working on a paper about a single parent raising a child after divorce. Frederick chimes in and tells Frasier that Lilith was hoping that Frasier would assist her on the article. Interestingly enough, once Frasier is out of the room Frederick turns to his mother and tells her that it was Frasier’s idea that they should work together, which Lilith agrees would be an intriguing idea. They discuss it over dinner and agree on the collaboration. As the evening progresses Frederick continues to maneuver each of them into thinking that they are missed greatly by the other. Eventually Frasier and Lilith confront each other only to compare notes and realize that they’re being “played” by Frederick. Lilith, who understands Frederick a bit better (probably because she has custody) determines that Frederick is playing a bit of a long game in the hopes that his parents will admit that they can never get back together again, and out of a sense of guilt, give him what he very much wants for Christmas and that happens to be a minibike, which is something that both Frasier and Lilith are opposed to getting him. What follows is bluff after bluff, Lilith and Frasier calling Frederick’s bluff, Frederick calling theirs, each one upping the ante. When they see Frederick is on the phone supposedly sharing the good news with his friends about his parents getting back together Lilith and Frasier listen in on the other line to hear Frederick gloating about getting his much desired minibike…. At least until Lilith announces herself on the other line, to which Frasier and Lilith give each other a high five for raising a perfectly normal child. I spoke of how this episode became our tradition. Keith and I were fans of the series, and during a vacation down to So. Cal. we booked ourselves a tour of Paramount Studios, as well as put ourselves on a reservation list to see a taping of Frasier while we were down there. It was a conditional list as first come seats would go to other studio personnel and actors who are interested in watching the series. Once those all filled up they would start taking people who had lined up outside the gate. While on the tour earlier that day we gained the favor of our tour guide because in our little group we were the only ones who spoke English. Everyone else was a tourist from outside the country and spoke very little English. As a result I chose to engage our tour guide partially because I felt sorry for her, but also because I’m a geek and wanted to ask questions about everything we were seeing. At the end of the tour we told her that we were there for our anniversary, we were on the conditional reservation list, and she promptly called her boyfriend who was in charge of show tape bookings, and guaranteed us a seat to watch this show. Shortly after being seated Kelsey Grammer came on to announce that he would be directing this episode, and he described the episode in the following manner. 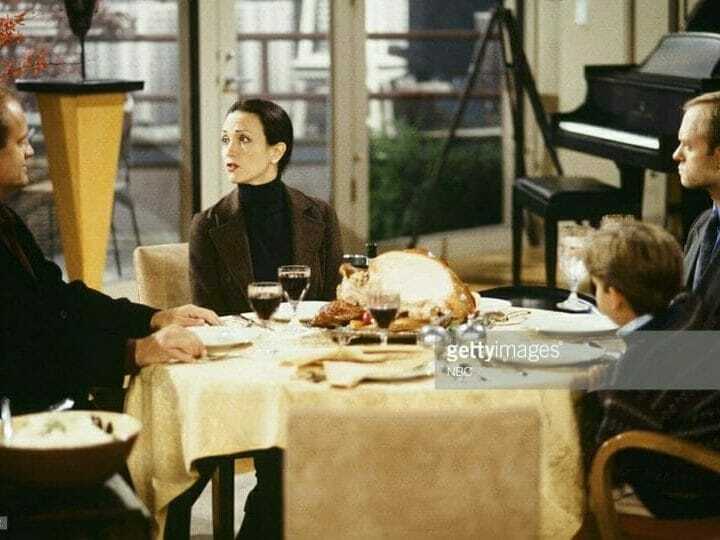 “It’s Thanksgiving in the Crane home, and Frasier is going to have Frederick spend the holidays with him. And that means that Lilith can’t be far behind.” Needless to say Keith and I looked at each other with complete glee and with the expectation that this episode was going to be a winner! It was fascinating to watch this episode be taped. Pretty much all of the set pieces needed for the episode are already set up. It’s a very wide stage with the living room and kitchen right where they appear in the episode. The master bedroom for the set was adjacent to the kitchen, and to the extreme left was the recording studio where Frasier works. They literally run through the entire episode twice without interruption and then they do pick-up shots. One of the most amusing moments happened in-between takes where they needed to film a scene prior to sitting down at the table to eat. David Hyde Pierce (Niles) was trying to remember where some of the glasses had been placed originally and Bebe Neuwirth (Lilith) just exclaimed, “Oh let me!” and she grabbed the glasses and put them right where they needed to be. Here we had something akin to life imitating art. By the time the evening was done, what essentially boils down to being a 22-minute episode without commercials took approximately 3 hours from start to finish to tape. It was an extraordinary highlight for us to experience TV magic happening right before our eyes. Now while this episode may not be the funniest of all from the series (it does have a few gags here and there that still make me laugh out loud), having the enormous pleasure of seeing a holiday episode being taped has earned it a place among our holiday traditions! Let us know what you think about our content in our webcast as well as our website. Please use the comment form below.